This easy Raspberry Peach Crumble is the perfect summer treat! Fantastically easy and amazingly delicious – this is one dessert no one will be able to resist! 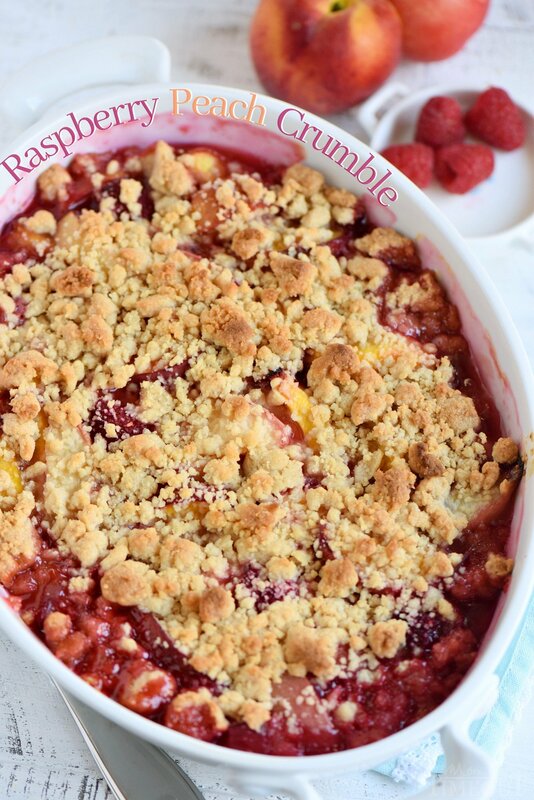 If you’re not a crumble fan, I’m pretty sure this Raspberry Peach Crumble will make you one. So easy to make and just bursting with the sweetness of summer! Ahhh summer time! It’s finally here and the boys and I couldn’t be more excited. We kicked off our summer vacation with a trip to Disney World and just got back a few days ago. Exhausted for sure but we had the most amazing time! Florida weather is so different from California weather and while I never quite got used to the humidity, I did fully appreciate the rain that occurred each day. 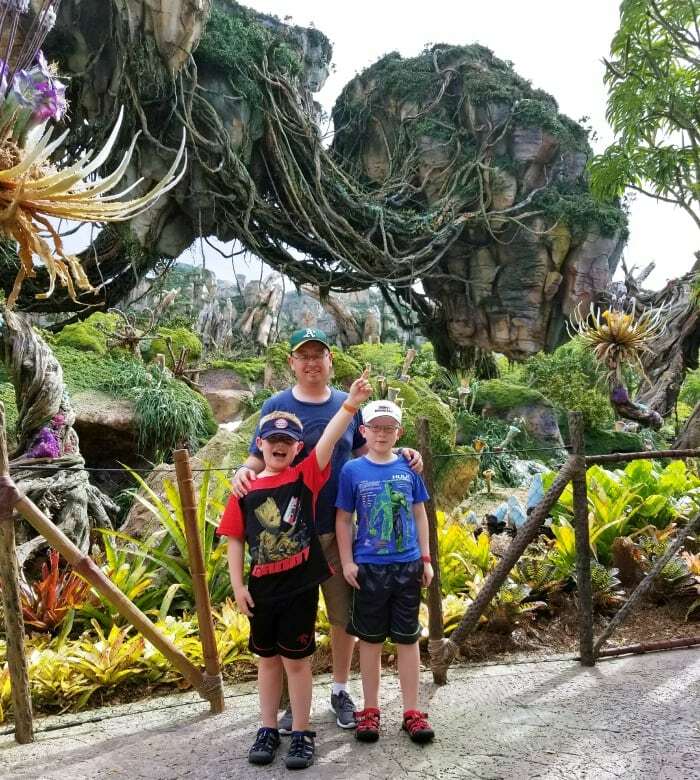 Reece and Bryce rode all the rides and we even managed to get on the new Flight of Passage ride at Animal Kingdom. I was doubtful that the ride was going to be worth the 3 hour wait… I was wrong. Seriously, if you get the chance, you really need to get on this ride. I heard other people saying it was an almost spiritual experience and I couldn’t agree more. You really feel like you are flying! All of Pandora was breathtaking. The colors were so vibrant and the attention to detail was evident everywhere we looked. We visited Animal Kingdom twice during our stay and Pandora was by far our favorite experience. Stunning! Anyways, we got back home and when I had the chance, I checked out the back yard and found almost all of our trees had ripe fruit on them just waiting to be picked. I headed straight for the peaches. We have this cool tree that has peaches, nectarines, and plums on it. The nectarines and peaches almost always ripen at the same time while the plums ripen a good month later. It’s kind of nice because the fruit lasts us almost all summer long. I made up this fantastic raspberry peach crumble using a combination of the peaches and nectarines. You could use just one or the other if you prefer. You’ll notice that I didn’t peel the fruit. I never do. I think it takes way too much time for a dessert that is supposed to be painless. The skin cooks down to almost nothing anyways and I’ve never once had any complaints. Plus, I love the color it adds! The crumble filling is a combination of peaches, nectarines, and raspberries. I add a little sugar to sweeten, a little corn starch to thicken, a little lemon juice to freshen and that’s about it. The crumble topping is just as easy. Butter, brown sugar, flour and salt. Mix until the pieces are sticking together and then sprinkle over the top of the filling. 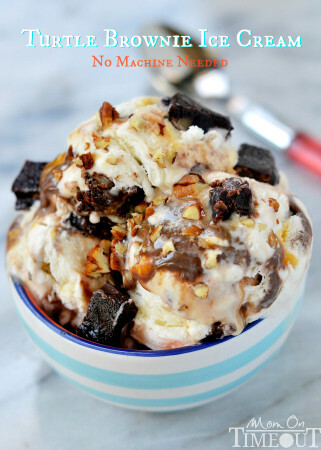 Bake until bubbling and serve with ice cream. Truly the perfect summer treat! I’ll leave you with this… don’t forget the ice cream! 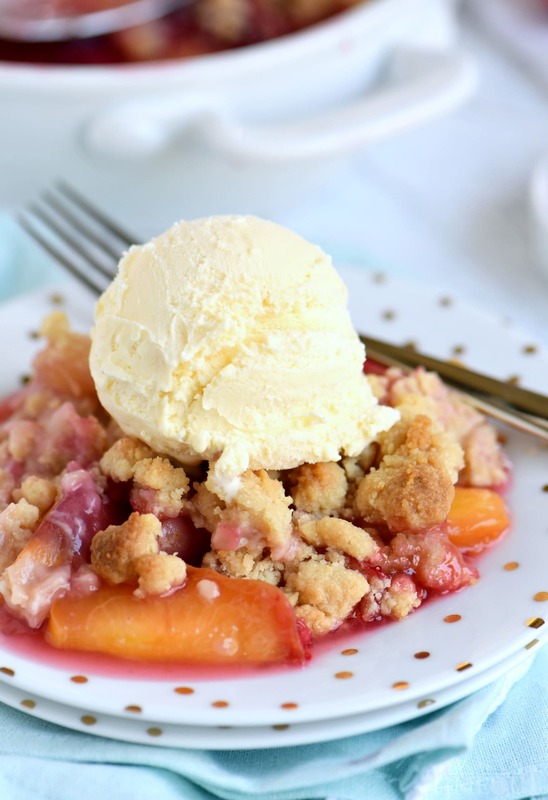 This easy Raspberry Peach Crumble is fantastic on it’s own but with ice cream? Fuggedaboutit. 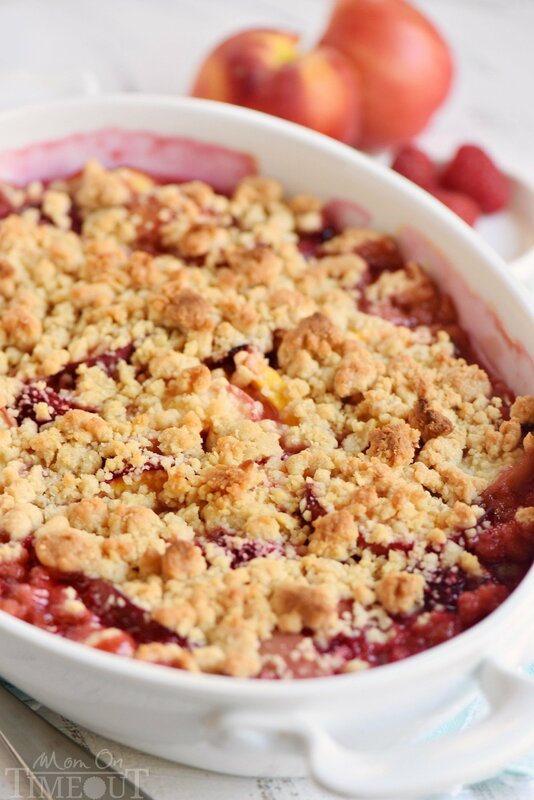 This easy Raspberry Peach Crumble is the perfect summer treat! 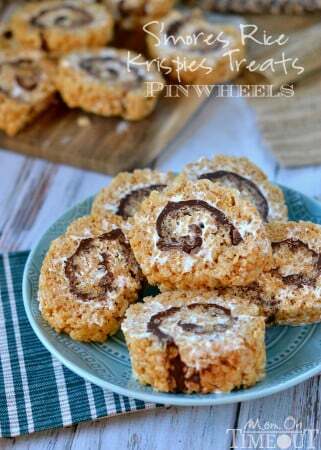 Fantastically easy and amazingly delicious - this is one dessert no one will be able to resist! Preheat oven to 375F. Lightly spray an 8 or 9-inch baking dish and set aside. In a large bowl, combine peaches, raspberries, sugar, lemon juice, corn starch and salt. In a medium bowl, beat butter and brown sugar together until light and fluffy. Add flour and salt and mix with a fork until crumbly. Use your hands if necessary. Sprinkled crumbs over the top of the filling. Bake for 45 minutes or until center is bubbling. Let cool for 15 minutes before serving with ice cream. My friends and I wanted to bake something yesterday, and when we stumbled upon this recipe, we knew we had to try it! We used fresh peaches and raspberries from the local farmer’s market and topped it with creamy vanilla ice cream. It tasted delicious; however, ours came out quite liquidy. We had to serve it in bowls and use a ladle to scoop it! We did have to prepare it first in two separate bowls (one for filling and one for topping), then we baked it about an hour later, after refrigerating it, so perhaps that caused it to be so puddly. However, it ended up being so delicious that we all agreed it’s something we’d make again! I had the same result and was wondering if maybe it should be 4 tablespoons of cornstarch instead 4 teaspoons? My usual rule of thumb is about 1 tablespoon thickening to each 2 cups of fresh fruit (Sometimes a higher ratio depending on the fruit) but the flavor was amazing!!!! I agree with Janice! I made with 4 Tbsp of corn starch and it was still very soupy – delicious, but soupy. I also added extra sugar which I recommend depending on taste preference. The crumble is great. Crumble desserts are a staple in the summer around here! Love the raspberry peach combo! I have the same question as Angela, Can this recipe be altered to use CANNED fruit? And if so, would it be drained? I absolutely love fresh fruit and try to use it as often as I can but in Winter when I do most of my baking, fresh is nearly impossible to get. Thank you so very much for sharing this, it looks DELICIOUS! Better to freeze the ingredients in the summer for use in the winter, just cut your fruit into bags to appropriate measurements, voila! This is something which I’ll definitely make, especially since I love (both) peaches & nectarines. I might mix them both together. Must I wait for these fruits to be in season, or can I make them from canned fruits, like during the winter? 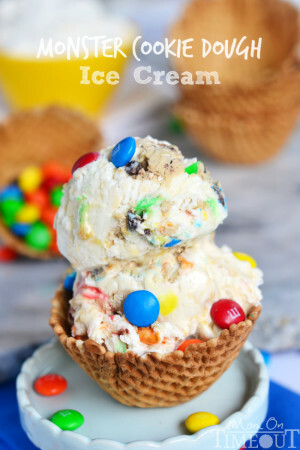 This looks so yummy, plan to try making one tomorrow. Thanks for sharing. Made this and it was yummy. Did not get a chance to take a picture because guess who cut into it right away. I plan to bake another one this week, I’ve already told my hubby do not touch it until I at least take a pic.